The colonnaded Parthenon atop the flat hill of the Athenian Acropolis is one of the most recognizable structures in the world, epitomizing Classical architecture. But the buildings below the Acropolis were more important to the history of both democracy and Christianity. 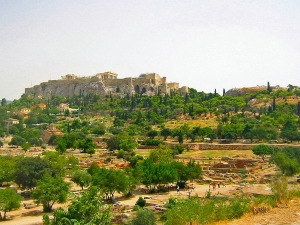 As early as the seventh century B.C., the lower area northwest of the Acropolis was cleared of houses and reserved for use as an agora (marketplace). After the Greeks defeated the Persians in 480 B.C., Athens became the most important city in Greece and the agora became the center of Athenian life. The agora included buildings where citizens enacted legislation and served as jurors in law cases. It also included temples and monuments to Athens’ pantheon of gods and goddesses, including Apollo, Hephaestus, and Aphrodite. The so-called “Altar of the Twelve Gods” established the point from which all distances in Athens were measured. A stone inscription referenced an “unknown god,” reportedly responsible for a devastating plague. West of the Acropolis a marble outcropping known as “Mars Hill” held the Areopagus, an institution performing various governmental functions over time. When the Romans conquered Athens in about 88 B.C., they largely retained the buildings and temples of the agora. 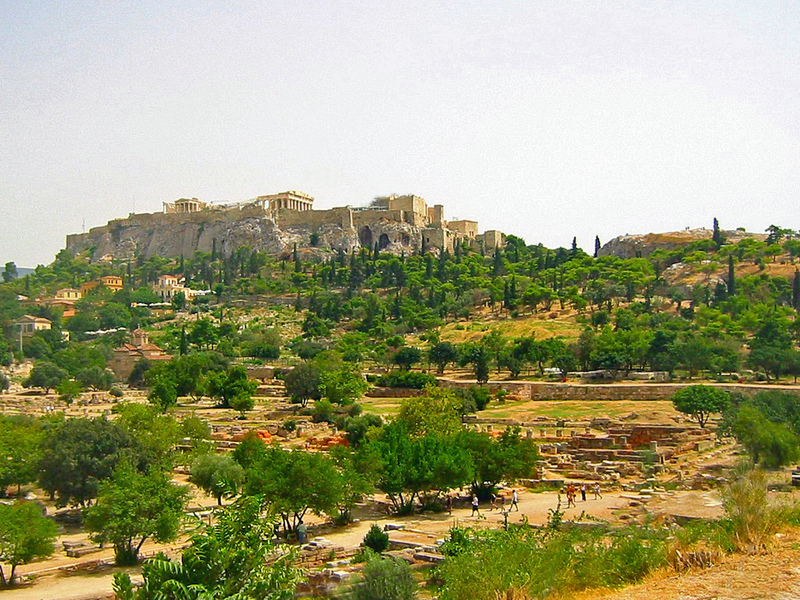 In the first century, people gathered in the Areopagus to discuss philosophical and political matters. According to the Book of Acts, when Paul visited Athens in about 51 A.D., he was distressed by all the idols he saw being worshipped in the temples. After seeking to make followers of Jesus among people walking about the agora, Paul debated Athenian intellectuals in the Areopagus. He argued that the transcendent God of the Jews was the “unknown god” they had been seeking. A few influential Athenians reportedly accepted Paul’s argument and became Christians. The Athens agora has been maintained as a public site and some of its buildings are remarkably well preserved. A plaque at the base of Mars Hill displays the argument Paul made to the Areopagus, reflecting Christianity’s current status as the state religion of Greece. The precise identities of the “Twelve Gods,” once worshipped at the center of Athens, are long forgotten.